James has come in for criticism this season following his move to the Los Angeles Lakers, with the three-time NBA champion looking set to miss out on the playoffs for the first time in 13 years. According to NBA data provided by Second Spectrum, James is the third-slowest player on defence in the league. James’ average speed when defending is 3.35mph, compared to Houston Rockets star Harden on 3.28mph and Dallas Mavericks’ veteran Nowitzki, who is the slowest in the NBA at 3.21mph. 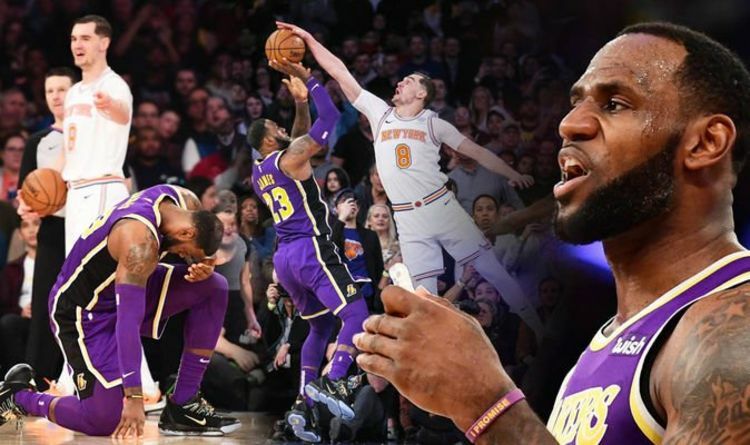 LeBron’s defensive play has been called into question by some after Los Angeles’ hopes of making the post-season suffered yet another considerable setback when they lost 124-123 to the New York Knicks who are only 14-56 for the season. Few have questioned LeBron’s scoring ability this season, although some are beginning to question if time is catching up with the four-time NBA MVP. The Lakers are currently 11th in the Western Conference and 9.5 games off the final playoff place. The humiliating loss to the Knicks by one point was only made worse as James had the opportunity to score the game-winning basket in the closing moments of the game. It appeared James had everything set up in his favour with 8.2 seconds left on the clock. Only one point behind, James had Knicks guard Mario Hezonja near half-court. The Croatian is not known for his defensive abilities, however, he managed to easily ghost James’ moves before following his drive into the paint. As James attempted a shot from the paint Hezonja even managed to block the shot and thus sealed a rare win for New York this season. The Lakers suffered their 14th loss in their last 18 games and pretty much summed up how their season has slowly declined in the run-in to the playoffs. LeBron did manage to finish the game with a team-high 33 points, eight assists, six rebounds, and a block at Madison Square Garden, but he only went four-of-15 from the field in the decisive final quarter. It was James’ worst shooting performance across his career in a quarter of playing basketball. There is still a possibility of the Lakers making the playoffs, however, with the recent loss in the Big Apple their chances remote. In fact they actually now have the 10th-worst record in the league. However, it appears that James is already looking forward to the off-season and what changes can be made to the roster. “There’s a lot of great free agents this summer,” James said. “Not going to name any names, because every time I say something, or our organisation says something about a specific person, we get in trouble.